Taken at face value, food is sustenance, an excuse to gather with friends or a celebration with loved ones—but it’s so much more. It’s also comfort and adventure, and food can be deeply laden with meaning. For those far from home, it’s an important cornerstone of identity and belonging. The idea of food being inextricably linked to identity is a powerful thread that runs through Kin + Deum, a Thai restaurant in London Bridge that’s quietly been making a name for itself with a creative, modern approach that’s also rooted in tradition. Opened by siblings Shakris, Roselyn and Bank Inngern in a space previously occupied by their father’s restaurant, it’s also a place that represents a symbolic passing of the baton from one generation to the next. Suchard Inngern, their father, arrived in London from Bangkok in 1975, eventually opening Suchard, his eponymous restaurant that still thrives on Tooley Street today. The restaurant’s success meant that, later, when an old Victorian pub on nearby Crucifix Lane became vacant, the elder Inngern was able to snap it up, moving his wife and three children into the flat above. The site below was converted into Suchard Freehouse, where local workers would gather for pad thai and spring rolls to accompany their pints of Guinness. “They came in for the food, and then they left—but it didn’t have the kind of atmosphere where you wanted to hang around”, Roselyn laughs. In possession of a handsome, noble facade and a location seconds away from then-blossoming Bermondsey Street, the site held more potential than the initial conversion originally suggested—something the siblings recognised early on. As fatigue and the prospect of retirement approached for the senior Inngern (not to mention the daily rigours of running two restaurants), a chance conversation one evening led to the exchange that would result in the creation of Kin + Deum. Kin+Deum. Image courtesy of Kin+Deum. Food and service had always been a part of the siblings’ lives. Shuttling between London and Bangkok, the trio came of age in the family’s kitchen, frequently helping out during busy services. However, as tends to be the case with the children of immigrants, a career in restaurants was hardly touted as a viable long-term option. Duty called, and Bank went to train as an economic advisor, while Shakris pursued a career in real estate. Meanwhile, Roselyn found success as a marketer at Unilever in Bangkok. With so much riding on the success of the new restaurant, the decision to reimagine it in their own image wasn’t something the siblings took lightly. “When this opportunity came along, we thought, ‘should we do it?’”, Banks says. “At that time, I wasn’t really sure whether I wanted to do it. Because we’d been through it before with my parents and it’s a really stressful industry.” Ultimately, the decision was fueled by Bank’s own passion for cooking as well as the opportunity afforded by the relative scarcity of creative, contemporary Thai restaurants in the city—especially those run by youthful Thai owners. As Bank assumed responsibilities in the kitchen, Roselyn and Shakris took control of service and strategy. Out went the dusty, dated furniture and telephone book of dishes, replaced by a soothing, minimal interior and a pared-down menu that offered familiarity while allowing the expression of the siblings’ cosmopolitan identity. Tamarind Eggs. Image courtesy of Kin + Deum. 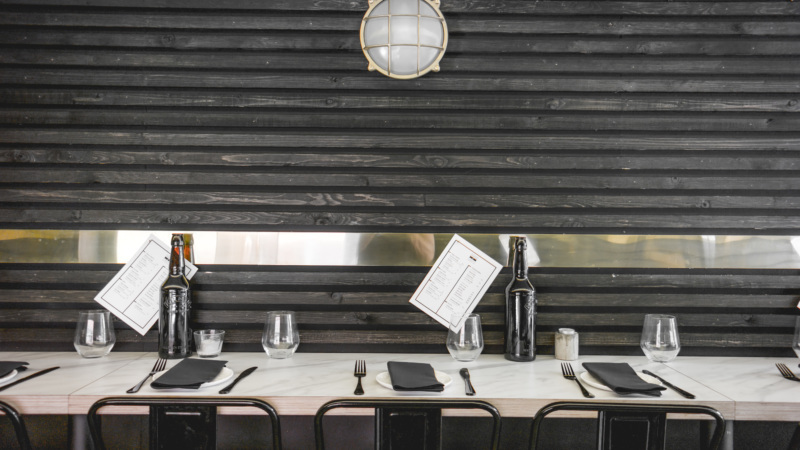 When diners step into the restaurant, the familiarity of entering a space that previously housed a Victorian pub becomes apparent: dark, lacquered timber benches, smooth parquet flooring, and a bar where drinks were served are the only holdovers from the previous space. By decking the interior out in soft pastels, plants, and plush back cushions, the siblings immediately added their own visual stamp to the space. Bank’s Massaman Curry. Image Credit: David Paw. As any food-obsessed individual can tell you, the last few years have seen a change in the average Londoner’s perception of Thai cuisine, not least with the emergence of restaurants like Jane Alty’s Begging Bowl in Peckham, or Ben Chapman’s Smoking Goat and Kiln. Borrowing heavily from the tradition and vernacular of regional Thai cuisine, these so-called “nu-Thai” restaurants have been widely credited with introducing many Londoners to dishes and flavours that ventured beyond the classics. He emphasises that the inclusion of classic dishes was a “conscious choice”, but it’s been the new additions to the menu that have turned out to be the most popular. His Thai dumplings have been such a hit that they’ve become irremovable fixtures, while honeyed coriander duck and his take on claypot prawns baked with silky strands of glass noodles are worth the trip to SE1 by themselves. Bank and Roselyn with Suchard, their father. Image courtesy of Kin+Deum. By making the conscious choice to serve the food of their childhood alongside newer, non-traditional dishes, the restaurant makes a quiet statement about its owners’ identity: proudly Thai, but savvy and secure enough in their identity to experiment and push boundaries. Diasporas are notoriously stubborn in their adherence to the traditions of ‘home’—and nowhere is this more evident than in food—but by taking dishes that had almost fallen into cliche and deliberately presenting them alongside their own takes on Thai cuisine, Bank and his siblings remind diners why they fell in love those flavours in the first place. In 2018, moving away from one’s home country doesn’t necessarily mean leaving everything behind. In a culture as deferential as that of Thailand’s, however, there’s always a final hurdle. And few hurdles are more daunting—or satisfying to clear—than that of a parent’s blessing. When the frenzy of their opening month had settled, the Inngern siblings finally welcomed their parents as honoured guests. Their reaction came as both a relief and validation of their efforts. “They were really surprised”, Bank recalls. “They told us ‘Actually, what you guys did worked’.” Any initial scepticism melted away, and their mother and father are now all-in on Bank, Roselyn, and Shakris’ vision. “They’ve changed their mind and believe that us kids are the new voices now”, he says. “They believe that, these days, you have to listen to the kids”.